PixelJunk Monsters first appeared in 2008 and was instrumental in Kyoto-based developer Q-Games and talisman Dylan Cuthbert establishing a ’brand’ that would spawn several titles across different genres. 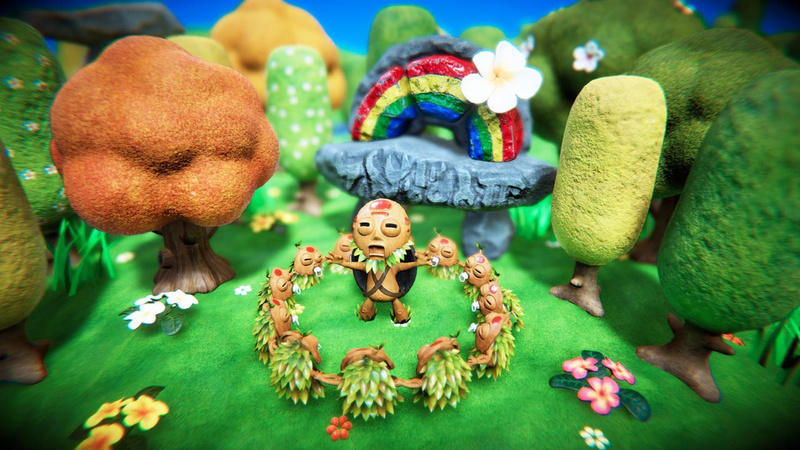 After taking a break to develop the glorious remake Star Fox 64 3D on 3DS in 2011 as well as releasing Monsters Deluxe on the Wii U in 2016, Tikiman and friends are back with a sequel that manages to feel both reassuringly familiar and contemporary. The premise of PixelJunk Monsters 2 is simple to grasp, yet the intricacies of strategy and resource management are difficult to master. 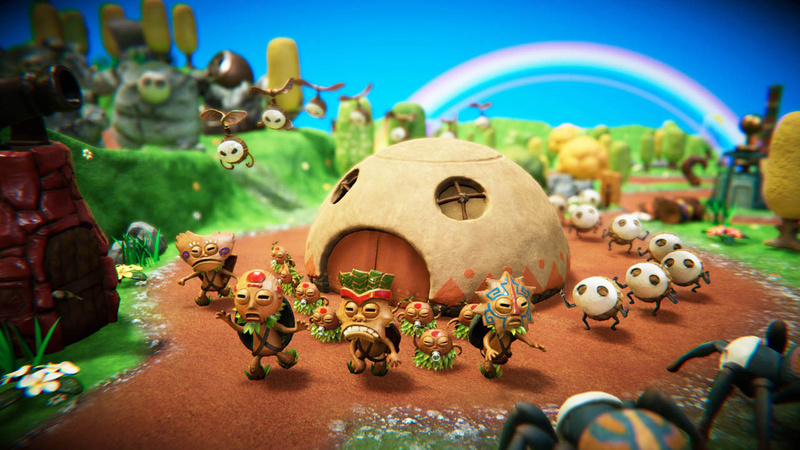 From the outset, rather than moving a cursor around the screen to place towers to defend a designated area, (as was the genre trend when the original was released), you are in control of an adorable masked creature called Tikiman, tasked with protecting a group of precious baby Chibis from wave after wave of beasties that will follow set paths and reach your hut unless you take the appropriate action. Early on, you'll realise that it's all about the coin. At the beginning of a stage, you are given a small stash of cash to build towers to protect your flock. 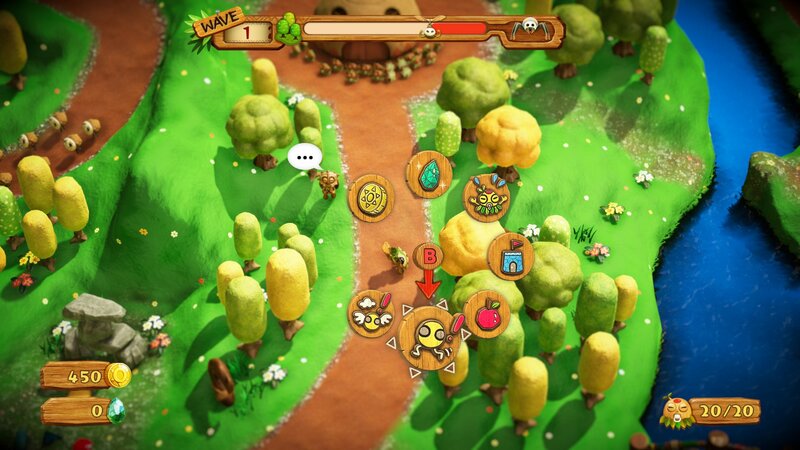 Although enemies do follow a set path on their way to your hut, they have multiple routes, and there are different types of enemies to deal with. All towers you can build have a limited radius, and you can choose from the three main classes of weaponry. The arrow tower is the all-rounder, but also the cheapest and weakest of the three. The ground-based cannon and air-based machine gun are designed for specific enemies and therefore more expensive. Fallen enemies drop coins that you can spend on more towers, but also gems that can be used to upgrade or be exchanged for fruit from a totem in each level called the Manic Merchant. While fruits can explode, slow enemies down or warn you of enemy paths, they can also damage Tikiman if handled incorrectly. 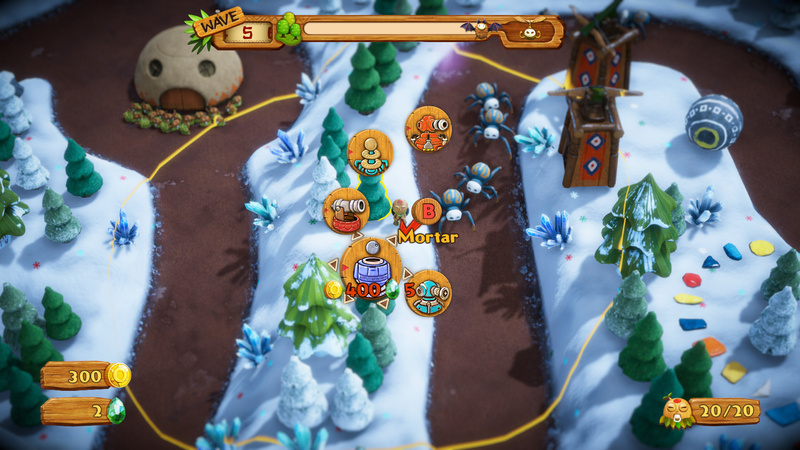 Each and every tree in a level can be replaced with a tower, which in turn can be upgraded five times. As well as using gems, another time consuming (but sometimes necessary) measure to upgrade towers is dancing next to them - it might sound silly, but it can be extremely useful mid-battle. Things might start out at a leisurely pace, but it really doesn't take long for it to ramp up the intensity. You'll need to think quickly and balance the positioning, proximity and variety of your arsenal. There are also situations with particular limitations, such as enemies that don't drop coins. This adds another layer of strategy and highlights the deceivingly complex nature of the game. As you progress, you'll be given ancient tokens to spend on customising your Tikiman. There are a wealth of cool masks and shields to choose from, and can especially come in handy when differentiating one another in the local or online multiplayer. Playing with a friend can be a double-edged sword because if you stray too far away from your host, you’ll get pulled back. Not exactly a deal breaker, but mildly frustrating, especially when dealing with multiple tasks. You'll be rewarded with a wide range of more elaborate weaponry for reaching certain milestones, such as upgrading a number of towers, using a certain amount of fruit and so on. It's fair to say that some of the weapons such as the laser don't really fit in with the naturalistic environments, but they are pretty fun to see in action and very powerful nonetheless. At the end of a stage, you'll deal with a boss that is not only much more resilient than anything else faced previously, but it will also spawn enemies of its own, demanding your attention and resources to be split between the different threats. Some bosses even alternate their ground and air-based attacks, requiring both heavier and more varied firepower. There isn’t much wiggle room regarding progression, as accessing the games five worlds requires an increasing number of rainbow fragments, earned by protecting all 20 of your Chibis. This can be a brutal learning curve at times, especially with no checkpoints when you’re one wave from a successful run, or there was just one enemy with a slither of health left that somehow managed to sneak through. With three difficulties (fun, tricky and mayhem) for each of the three stages, things can get hectic and frustratingly ‘all or nothing’. Each stage will take a lot of tries to learn both the layout, enemy waves and attack patterns. One of the main technical differences from the first game (although the developer is working on a patch which will include the more traditional ‘full-screen’ option) are the bigger areas, a change that becomes more than apparent when you realise Tikiman doesn’t have a speed-up option. When things kick off, and they do, you’re constantly moving as your artillery needs repositioning and upgrading. Although each stage does have fenced off areas, it can sometimes feel overwhelming. Anyone familiar with the first game will immediately notice the radical aesthetic upgrade. Basic 2D sprites and flat landscapes have received a complete overhaul, replaced with full 3D, almost Claymation-looking character models. 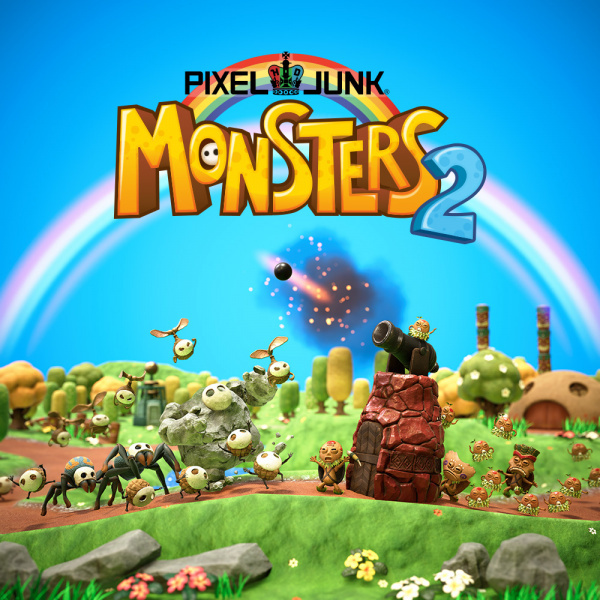 Make no mistake, while everything seems to have a bit of a softer focus in handheld mode, PixelJunk Monsters 2 is absolutely stunning when docked. Whether it’s the lush green fields of Pockulu Forest or the lava-tinged Gardans Caves, the environments and the characters that inhabit them are bright and beautiful. As well as the aesthetics, the terrain boasts a level of verticality and diversity absent from the original game that you can use to your advantage, but can also prove to be agonising when you are in a pinch. It is gut-wrenching to see a well-timed shot take out a dangerously close enemy, only to see the dropped loot spew all over the place and fall into a chasm or river and be lost forever. At best this is a harsh learning process, but at worst it can be the infuriating difference between success or failure. Charming, addictive but sometimes ruthlessly unforgiving, PixelJunk Monsters 2 has made the transition into 3D almost unscathed. While there is a sense of ‘if it isn’t broken, don’t fix it’ in some instances, it's still a gorgeous, lovingly-crafted and action-packed tower defence game that despite a few annoyances, will delight, entertain and challenge in equal measure. Really enjoyed this game. Really liked the change to 3D but would love a button to see entire Map, as well as the return of being able to show every towers exp bar so know where I need to focus my sweet dance moves. Bloons TD5 tomorrow apparently! Seems Switch is getting the tower defence games woot! I absolutely love this game. Never played the first one, but didn't take long to get addicted to this version. While there are unforgiving moments I do welcome the challenge. I think without those it would be too easy. My only complaint is that the masks and shields you buy with ancient tokens are strictly aesthetic, making it feel as though the reward of tokens is rather useless. Other than that this is a fantastic game. I've stuff this before, but now playing through the entire game I'll say it again. Here's the negatives first. -This means you don't really know where monsters are, or where they die and drop coins. There is an arrow for where the coins are dropped, but that doesn't help too much once you are close because it might be behind one of several trees. 2. You have to stay near your friend in coop. -This isn't in the demo but in gameplay videos and it shows that if the secondary player walks away from the main player he teleports back to the field of view. So if you need to work on towers that aren't nearby well that's too bad. (I think they don't realize how many people play this game for the relaxing and challenging couch coop. 3. The towers don't really change in obvious ways when being upgraded. -Instead of having the towers change color there is just a little flag that changes. This flag can be very hard to see sometimes because of the 3D design. If you have many towers it can be hard because you really need to just remember what levels your towers are. It is really much better having those visual cues in the first game. Also, part of the fun for me was getting towers to level 5 because they turned gold. Now there is no visual change in the tower which seems almost lazy, and I was confused as to why my tower wasn't upgrading when it looked the exact same as level 1 towers next to it. 4. A single tower doesn't take up a single tree. -At times I found myself planning on putting two or three towers in a certain area because there were 3 trees there. When the monsters got close I build 1 tower there... that tower demolished all 3 trees and so I had to change my strategy on the spot. If there was some standard this wouldn't be an issue, but sometimes turrets take up 1 tree other times 2 or 3. 5. The 3D environment just doesn't work. -Not the 3D rendering with the special cinematic view, which although neat looking makes it nearly impossible to really play, but the hills you have to jump over at times, and that mostly just get in your way. It doesn't feel natural or fun, just bothersome. 6. It's not nearly as meditative. -The first game was relaxing to play even though it was next to impossible at times. The music was nice, dancing on towers didn't pull away from the relaxing music. In this game it is close but not the same, I think partly due to the map sliding around. Here are a couple of improvements. +1. There is a cool overworld. 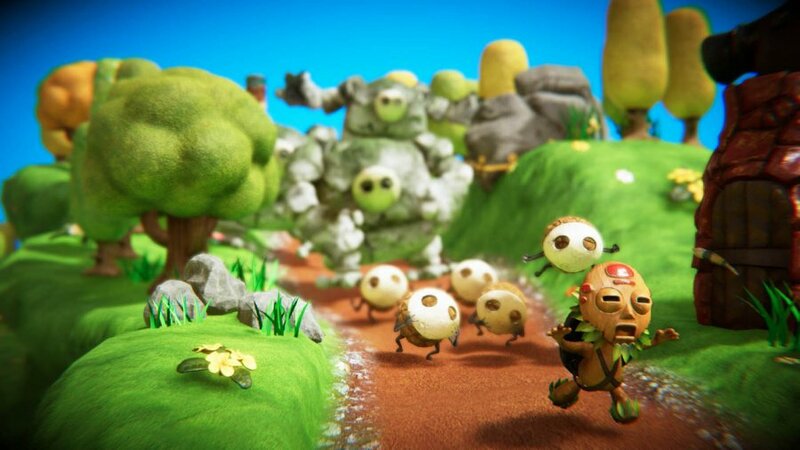 -I like the idea of running around the tikiman's little world and seeing little chibi's around. It's much more engaging than the island map in the first game. I just hope that it is actually an island and you can see the water at parts and that it doesn't feel too disjointed as you explore further. +2. The graphics look better in some ways. -I think the old graphics are great, more relaxing, and much easier to follow the entire screen. But, the 3D models are still well designed and interesting. I was thinking about this one but found the framerate and general performance really lacking in the demo. Not to discourage demos, I generally really like Spike Chunsoft and buy their stuff. Just kinda was hoping it'd be better optimized. I'll happily buy a cheap port of the original game, though. I was floored by the art style in the demo. And the game itself was a lovely challenge. Will be investing in it soon. These guys really have come a long way. Bought after playing through the demo twice. Its pretty challenging, but fun! How is the multiplayer in this? The description says 4 players... just wondering how that works. Love the first game of this series played it for countless hours on my PSVita , the graphics in this new title are simply beautiful my only complaint is the camera it definitely needs to be addressed it takes fun away from an otherwise outstanding title the 3rd person view is cool but not helpful it would be great if the camera had a proper zoom function and a proper rotate feature were you could atleast rotate the view all the way around your character 360 . It still has the charm of the original and there is a ton of fun to be had. It would be great if they would add online leaderboards as well like the original. @XenoShaun the developers recently released a video of the first update that will include full map zoom and co-op scaling zoom. Steam first then consoles but they reckoned it wasnt gonna be too long for us. I've been playing this game for the past week or so. The comments in this thread are accurate and I think 8 out of 10 is a fair score for this game. When researching this game, I found a lot negative comments about it, but don't let you get it down. It's a fun game to play. The 3d view is nice, but not used all that much. Also there will be DLC that adds more content in the future. @Daftbomb That is awesome. That'll help so much !! @ypeels40 I think I read Encore is releasing this week and the Danganronpa DLC was start of July? May of been Steam ver only though. Wow I gotta give it some credit, this art style is absolutely fantastic! OK game, not as fun as Kingdom Rush. I like the art style, tried out the demo, can't say the gameplay is something special. Anyone know how to access that?